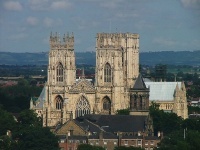 For over a thousand years, York Minster has been the principal place of worship in York and its surrounding areas. The largest Gothic cathedral in Europe, this impressive building is open to the public and visitors can enjoy the peace and beauty of the interior of the church and its many stained glass windows, including the well-known Rose Window. Visitors are also able to marvel at the fascinating ancient remains held beneath the church, in the Undercroft, and to enjoy the spectacular views from the top of its 275-step tower. Audio tours are available and York Minster also has its own gift shop, as well as a restaurant and café.